The most common cause of the vinyl cover fading and cracking is the use of damaging products – abrasive products will strip the top, protective layer from the vinyl causing it to fade, crack and disintegrate. A proper vinyl cleaner will provide an extra layer of UV protection for your cover. HOW TO USE LESS CHEMICAL AND PROTECT YOUR COVER INVESTMENT? Enzymes are natural compounds that target grease, oil and organic matter, breaking it down before it accumulates in your hot tub. The right enzymes can also kill many bacteria. Consequently enzymes act both as a natural sanitiser in your hot tub and as a water cleaner and clarifier. So, enzymes reduce your need for chlorine or bromine down to a very miminal level and they also reduce your need to shock the water. 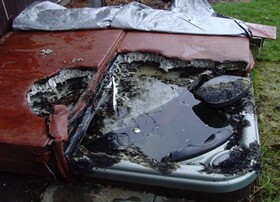 Thus dramatically reducing the need for the harsh chemicals that will damage your cover. 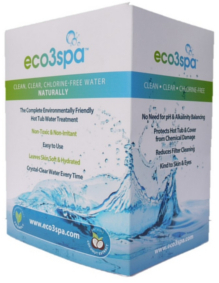 eco3spa is a chlorine and bromine free natural hot tub water treatment that relies on the natural disinfecting qualities of natural enzymes combined with Active Oxygen to keep your hot tub water sparkling clean. eco3spa is kind to you, kind to the environment and kind to your cover!